Sometimes a command that you execute complains about a dependency being missing on the system. From the file name in the error message it is often not possible to know exactly which package needs to be installed to resolve the dependency. Similar to yum – install package that contains a specific file on RHEL-based distros, Debian / Ubuntu also offer a utility to search the package repository for packages that would install certain files. This utility is not installed by default and is called “apt-file”. To install “apt-file” execute the following command. 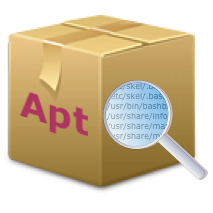 The “apt-file” utility uses the index provided by the different repositories to search. This index file needs to be downloaded before the first search can be started and should probably be refreshed from time to time to have accurate results. This is the “update” command used to perform this update of the indexes. Note that not all repositories provide such an index file. While updating the index of apt-file, the repositories that do not provide such an index will be stated. With the freshly updated index, the first search can be performed. Lets find out the package that installs hkt, a check utility for OpenPGP/GnuPG keys. The find command is used to perform the search through the indexes. When the “bin/” is added to find a program, the results will match the path the program is installed to. In the example above, the match will find the program if it is located in any “bin/” or “sbin/” directory allowing you to find any executable program that installs to a default location for executables. The command above shows how you can then use “dpkg” to show the rest of the files that would be installed with the package. This entry was posted in Linux Administration, Security and tagged apt, apt-file, Debian, gnupg, hopenpgp-tools, Linux, LinuxMint, ubuntu. Bookmark the permalink.